The mysteries surrounding the pulsing of the much loved soft corals belonging to family Xeniidae is something that has intrigued me ever since I first got into this hobby. From reading many peoples experiences on the forums it seems that these corals will either thrive to the point where is becomes a nuisance to the hobbyist, or fail to take to tank conditions well and die a slow death. Why is it then that people have such extreme contrasting experiences with this coral? It seems that no one has a definitive answer to this question. Whether it be differing flow rates, lighting or nutrient availability, there seems to be no simple answer. In a world where coral behaviour and prosperity can often be linked to the results of quick test, identifying a lack or abundance of an element of the water that is contributing the demise of a coral, it seems strange that something as common as xenia continues to cause such problems. With this in mind I decided to conduct an extensive search of the web, sifting through endless pages of forums and scientific articles, to try to piece together exactly what might be the key the successful keeping of this coral. Starting on the forums, a quick Google of “xenia not pulsing” brought with it the perhaps not unexpected lists of post of people experiencing this problem. After looking through these posts, it seemed no one had any definitive advice on exactly what was going on. Some suggested trying it in different flows, others moving it up in the tank for improved light levels, whilst others suggested adding iodine to the tank might be beneficial. It seemed then, that there wasn’t a quick fix solution for everyone’s xenia needs, so I thought I would have a look at the scientific journals and see if anyone had tried to tackle the problem. What are the benefits of pulsing to xenia? A quick search and a paper immediately popped up. Titled “Benefit of pulsation in soft corals”, it sounded promising. The research had been conducted on Heteroxenia fuscescens fuscescen (the Pulsating xenid) by researchers at the Hebrew University of Jerusalem and the Technion-Israel Institute of Technology. The study used a technique known as particle image velocimetry (PIV). This technique involves seeding the water with tiny glass spheres; these spheres are then illuminated with a laser and filmed with a high-speed camera. The spheres reflect the laser light and follow faithfully the flow of the water that they are in. The trajectories of these spheres are then tracked with a high-speed camera, allowing, amongst other things, flow velocities to be calculated. It is a technique that I actually use in my own research, and is very good at studying energy transfer in fluids and revealing the dynamics of fluid motion in different systems. The results of the experiments were enlightening. Xenia corals rarely directly ingest food particles, meaning that they get nearly all of the sustenance from the symbiotic algae that they host within their zooxanthellae. It might seem reasonable then, that the pulsing action somehow improves the uptake of dissolved matter from the surrounding fluid. The results of the PIV experiments gave a good insight into the fluid flow around the pulsing polyps of xenia. It was found that the pulsing enhances fluid mixing around the polyps, and also effectively prevents the re-filtration of fluid from surrounding polyps. So the mechanical action of the pulsing was revealed to enhance fluid flow around the polyps, but what might these mean in terms of benefits to the coral? 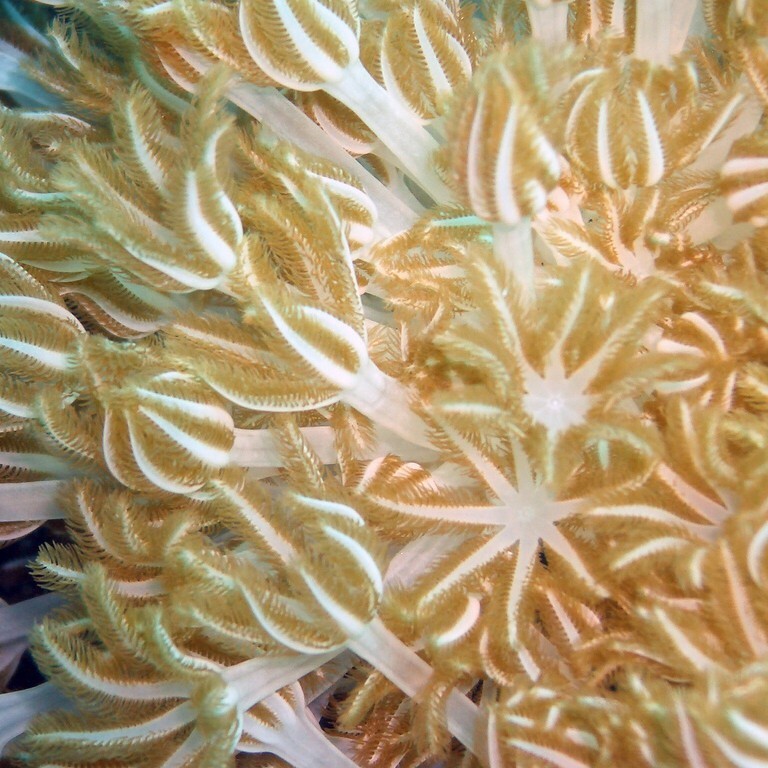 A further set of experiments demonstrated that pulsing greatly enhances the net photosynthesis rate in comparison to a non-pulsing coral, revealing that the benefit of pulsing was down to an improvement in oxygen exchange rates across the zooxanthellae of the polyps. So, now we know why the corals pulse, perhaps it will help us in identifying why they stop pulsing in our aquariums. The aforementioned study reported that their xenia, would take “breaks” typically when light levels were of a medium intensity. Suggesting that it occurs when the benefits of pulsing on photosynthesis had been reduced. However, more often than not problems with xenia in aquaria are persistent non-pulsing and dying, so cannot be explained by this apparent resting that occurs. Indeed, although the study was convincing in its explanations of the benefit of pulsing in xenia, the mechanisms by which pulsing might be encouraged or hindered were not. So why isn’t my xenia pulsing? There seems to be little in the way of research onto this. So we have to go back to the Internet and books to look for answers. I previously mentioned iodine supplements as being a solution suggested by some. There is good reason for this, with various sources claiming it will aid in the corals growth. From looking at some forums, there are definitely a few cases where it has worked. I for one however don’t like to dose my tanks, and have read several reports where xenia has been thriving in tanks that are not dosed with supplementary iodine. Perhaps this serves as a quick fix, but shouldn’t be a long-term solution to ensuring your xenia is pulsing. Insufficient light levels have often been sited as the cause. I have read of xenia slowing down in their pulsing intensity when placed lower in the tank, but coming to life when moved to more favorable conditions higher up in the aquarium. We have since learnt from the scientific article discussed earlier, that xenia will enter a period of rest during parts of the day with sub optimal lighting levels. Perhaps then, xenia that are not pulsing are just in a state of perpetual rest, with the photosynthetic benefits bought about by pulsing not outweighing the added metabolic cost bought about through the action of pulsing. Flow is probably the most common explanation that I found on the web.It seems that it certainly has an effect. From reading around it seems that a low to moderate, non-laminar water flow is what is often reported as being best. From personal experience I found xenia did not do well when placed in a region of high continuous flow, with the xenia not pulsing and bending over in the intense current. Anthony Calfo, author of the book, “Book of Coral Propagation: Reef Gardening for Aquarists” (Reading Trees Publications, 2007). Reported a phenomenon by which his xenia would stop pulsing as soon as the pH fell below 8.3. It is worth considering when most would point to flow or light levels, that something as simply as this could be the cause. So it seems there is still no definitive answer to mysteries surrounding pulsing in xenid corals. It is hard to single out one, or even several of the issues discussed as the main contributing factor to pulsing dynamics in xenia. Saying this, a non-pulsing xenia does not necessarily mean an unhealthy xenia. My readings of the web have found many accounts of non-pulsing xenia readily growing and propagating in the tank. So pulsing is not essential to the life of these corals. But if, like me, you think a mass of pulsing xenia is one of the most beautiful sites you can see in a reef, then the information compiled here will hopefully help people to alleviate their xenia woes in at least some way.